Did you know there are key health benefits that can result from owning a pet? A furry companion can enhance your physical, mental, and social well-being. 1. How can a pet help your physical health? Owning a dog, for example, may encourage you to get more exercise. With your faithful friend at your side, you’re much more likely to go for a walk. Walking is one of the best health activities you can do. While walking you’re also more likely to interact with your neighbors because your special pal often acts as an ice-breaker. Research led by Dr. Karen Allen at the State University of New York at Buffalo shows that pets can help lower blood pressure. Stockbrokers with high blood pressure were studied to see what happened when they adopted a pet dog or cat. 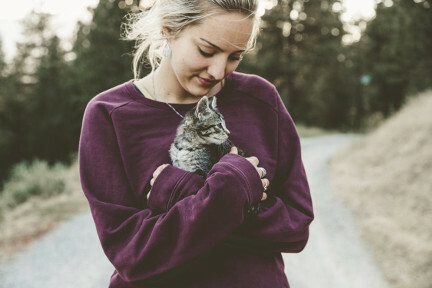 Researchers concluded that having a pet nearby helps control increases in blood pressure due to stress. In his studies, Alan Beck, ScD (Professor of Animal Ecology, Purdue University) found that the simple act of petting your dog slows your heart rate and causes your blood pressure to drop. An added health advantage from pet ownership is that patients may live longer after heart attacks. Some doctors recommend that a heart attack survivor adopt a dog because research has shown that a faithful canine companion can help prolong an owner’s life. 2. How Can A Pet Improve Your Mental Health? Pets can help their owners overcome depression through their companionship and unconditional love. They seem to possess the natural ability to help you relax and enjoy life more. Pets can also help when you experience times of loneliness. English poet, Alexander Pope, has stated that histories are more full of examples of the fidelity of dogs than of friends. According to a Chinese proverb, dogs have so many friends because they wag their tails, not their tongues. When you take care of a pet, you have to develop a routine of getting out, buying food and providing exercise. This can help fight off depression and loneliness. The simple responsibility of pet care can help you get your mind off yourself and your problems. 3. How can a pet enhance your wellbeing in relationships? Pets are more than just a member of the family. They’re central to a healthy lifestyle. They help lessen tension between family members and add a lot of fun and unconditional love to the homes where they live. When pets do cute and funny things, which they often do, family members react by laughing and being more relaxed. If you don’t have a pet yet, consider making one part of your family, but make sure you have the time and resources necessary to provide a stable loving home for your new friend. If you choose a dog as your new pal, remember this wise old saying. “A dog is man’s best friend.” That’s true in more ways than one. You’ll get unconditional love, companionship, loyalty, and relaxation in return for your investment of time and material resources.